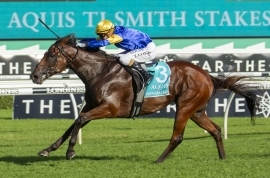 The daughter of Fastnet Rock will be offered by Aquis Farm in foal to Widden Stud’s outstanding young stallion Zoustar. His most recent success was in the autumn carnival’s feature sprint, the G1 TJ Smith Stakes over 1200m at Randwick, when he put 3.5 lengths on the best sprinters in Australia who between them had won 13 G1 races and $42.5m in prizemoney. Santa Ana Lane will now take on the world, heading to Hong Kong for the Chairman’s Sprint Prize at Sha Tin on Sunday April 28, just five days before the Chairman’s Sale. He may then push on to the Golden Jubilee Stakes at Royal Ascot in June, before a possible tilt at the world’s richest turf race, the $14m The Everest in October. Aquis Farm CEO Shane McGrath described Fast Fleet as “an outstanding physical and a mare at the peak of her powers’’. “She is only 12 and has been very conservatively mated’’ McGrath said. “On her one mating with a top-class stallion she has produced arguably the best sprinter in the world which speaks volumes for her quality. “She is in-foal to one of the most exciting young stallions in the world and is an appealing mating for plenty of the most commercial stallions in the land, so I expect she will appeal to a broad cross section of people’’ he added. Inglis’ Chris Russell said: “Aquis Farm and the Fung family have been great supporters of our sales right throughout the year, particularly last week at the Easter Sale and we are delighted to be able to offer a mare of this quality on their behalf. The Chairman’s Sale will be held at Riverside Stables on the evening of Friday May 3, from 6.30pm. Fast Fleet joins the likes of Loving Gaby’s dam Maastricht in foal to I Am Invincible, Symi (a winning sister of G1 Blue Diamond winner Catchy) and Sensibility – a Group 1-placed Redoute’s Choice mare in foal to I Am Invincible – as early Wildcard entries.